Apple hopes to improve its Apple Maps app and service by rebuilding them from the ground up with all new data. Apple launched Maps six years ago relying on data from third-party providers such as TomTom. The launch was shaky at best, as the map data was often incorrect or out of date. Apple promised to improve Maps over time, and it did. Four years ago, however, Apple decided to wholly reimagine maps by starting over. Apple has its own fleet of cars to gather information, and it is using "segments of trips you take that have been anonymized," according to TechCrunch. This information comes directly from iPhone owners and is used by Apple to determine the validity of routes and whether or not there's traffic congestion. Apple says the data is completely anonymous and only ever takes a small picture of an entire trip without recording the beginning and end points. Even so, iPhone owners can opt out of the data collection using the privacy settings in Maps. Eventually, users will begin to see more information in maps, such as foliage markers, parking lots, pools, sports complexes, accurate building shapes, and pedestrian pathways. Apple says it has thousands of people working all over the world to improve maps. 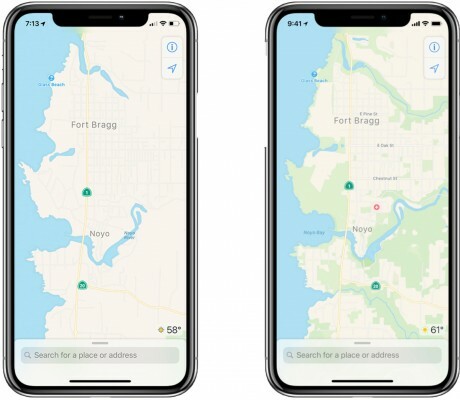 Apple is going to launch the new map data in the Bay Area in early July, with a broader rollout in Northern California expected with the arrival of iOS 12 in the fall. Apple didn't say when state- or country-level maps will be available. Microsoft has updated its Groove Music application for Android and iOS devices for the first time since September 2015. Microsoft says the refreshed application offers a number of performance and feature improvements. The latest version of Google Photos for Android devices includes a new video stabilization tool. Google's software goes beyond what the individual phone's own hardware and software do to improve videos. Google today launched two new features for Google Maps for Android: a Wi-Fi Only mode, and the option to store offline map data on removable memory cards. Together, the two features are especially useful for those traveling overseas, where data roaming is expensive. Facebook wants to make it easier for people to find and receive help during crisis and other events. The social network today said it will allow organizations and businesses post in the Community Help section so they may offer information and/or assistance to those impacted by adverse events.